My wife and I recently returned from an amazing 3.5-week adventure traveling through Vietnam and Cambodia. Our itinerary took us from the bustling capital of Hanoi to the glorious mountains jutting skyward from Halong Bay, then to the former imperial capital of Hue and the quaint festival city of Hoi An, on to the mountain retreat of Dalat and to modern Ho Chi Minh City (Saigon), and finally to the indescribable temple complexes at Angkor Wat in Cambodia. While it was wonderful to view the region’s gorgeous landscapes and fabled monuments, what made this adventure truly unforgettable for us was its many opportunities to interact with Vietnamese and Cambodian people from all walks of life: a Buddhist nun, an older couple whose homes were confiscated by the Communist Party, a former South Vietnamese soldier who survived the re-education camps and rose to become major of his village, eager students at Dalat’s rapidly growing university, former Viet Cong fighters, and ethnic minority hill tribes rarely contacted by outsiders. Today’s and tomorrow’s posts showcase some of my favorite portraits, some of them not yet previously published, featuring a wide range of people we met during our adventure. The portraits will be presented as a photo essay, but I will include brief descriptions of each and occasionally some commentary about how they were made. 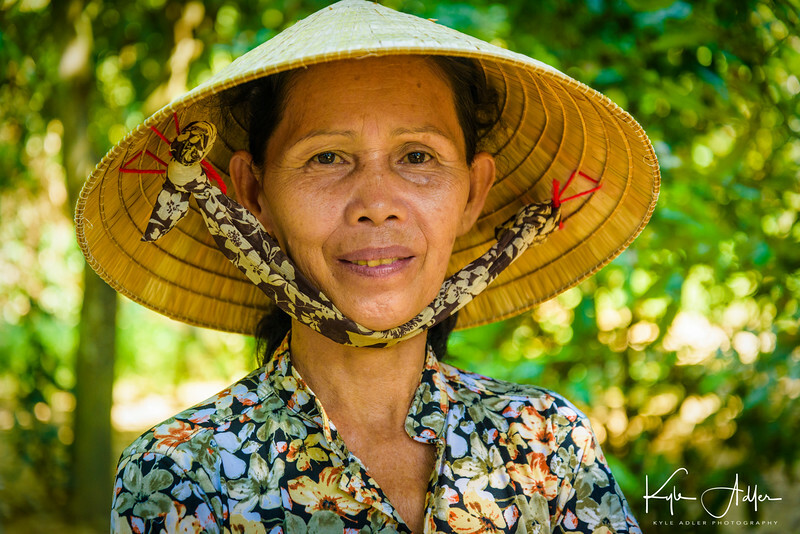 You can click on any of these images to view or purchase them and many more from the Vietnam and Cambodia trip. 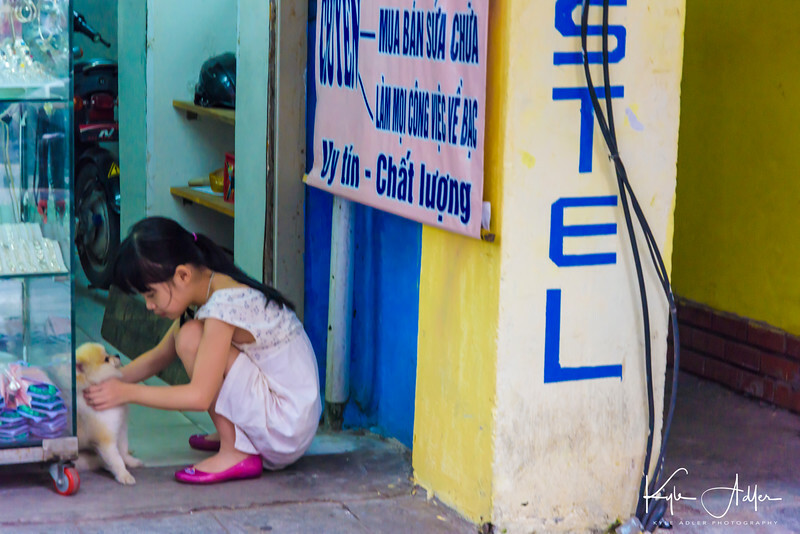 Street portrait of a little girl petting a small dog in a Hanoi store. While still a source a food in Vietnam, dogs are becoming more common as pets in urban areas. This image was shot from a cyclo-rickshaw, a great way to travel in urban areas of Southeast Asia and an especially good platform for street photography, as this way you travel at eye level of people on the street but will not be noticed as you pass by. Motor scooters are the major form of transportation in Vietnam’s cities. Whole families of three, four, and even five people commonly share rides. 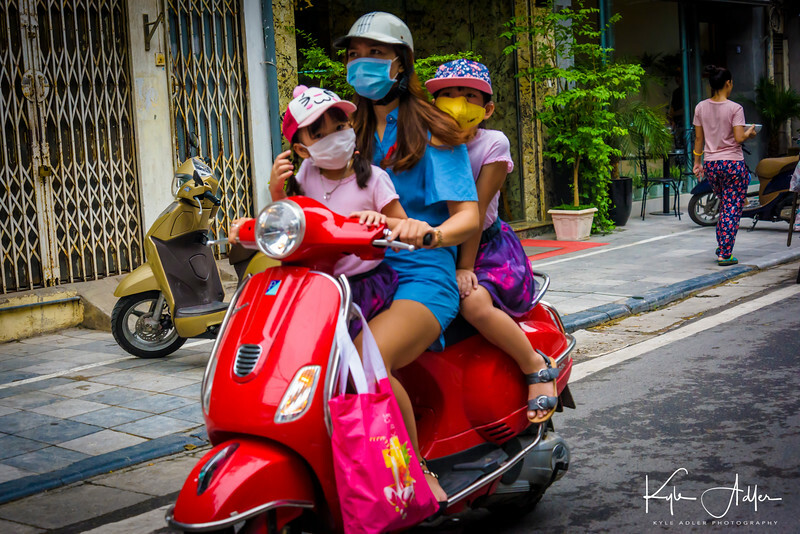 I’m always looking for striking color palettes, and here I loved the family’s vibrant colored clothing, each person wearing a different colored mask. 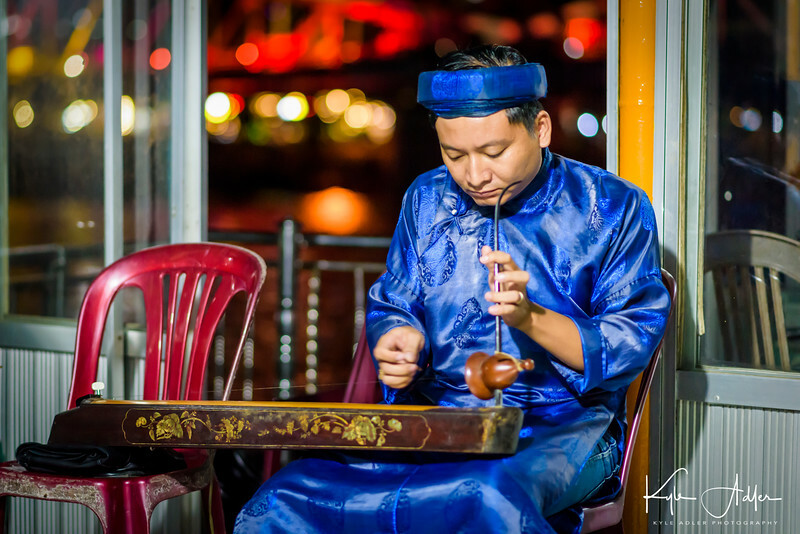 Phan Tranh Liem is one of the few remaining practitioners of the 1000-year-old Vietnamese tradition of water puppetry. He makes his own puppets, creates the shows, and performs them with his wife. 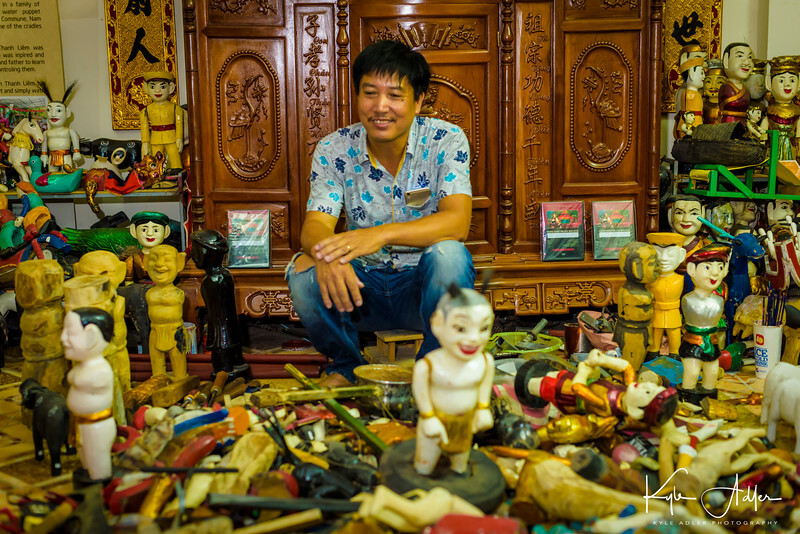 I made this environmental portrait of Mr. Phan, surrounded by a few of his puppet creations, in the workshop of his Hanoi home. At a local market outside of Hanoi. Dog meat is a local delicacy (and quite pricey). 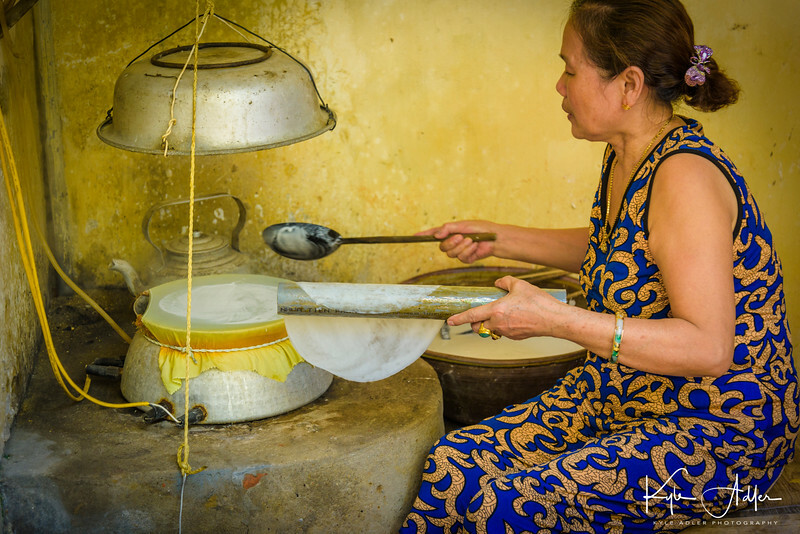 In the village of Tho Ha, 20 miles north of Hanoi, we visited the home of a family who make rice paper, the main occupation in the village. Spring rolls are extremely popular throughout Vietnam, so there is high demand for rice paper. An environmental portrait is framed to include not only the subject but also enough of the surroundings to give the viewer a sense of the subject’s life. 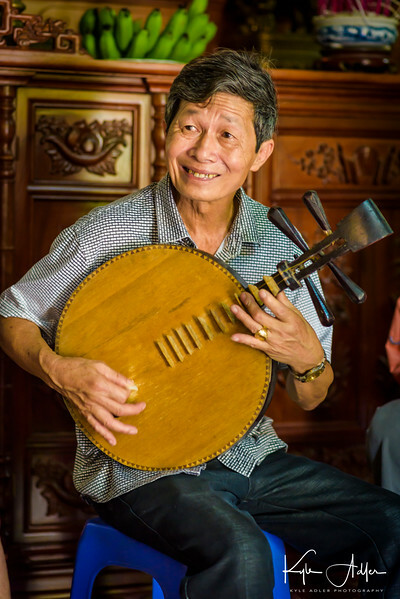 The head of the household plays a traditional Vietnamese stringed instrument. 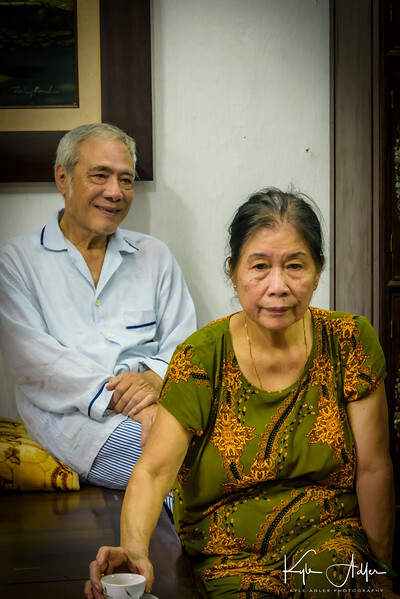 In the village of Bat Trang outside of Hanoi, we visited the home of Mr. Duc and his wife. After the war, their homes were seized and they were persecuted as “landlord oppressors” even though they had never exploited others. They recovered one of their houses decades later. It can be a challenge to make a candid portrait of a couple. Here I used a fast normal (50mm) prime lens with a medium aperture so that both wife and husband would be rendered in fairly sharp focus but without requiring a very slow shutter speed or very high ISO setting. 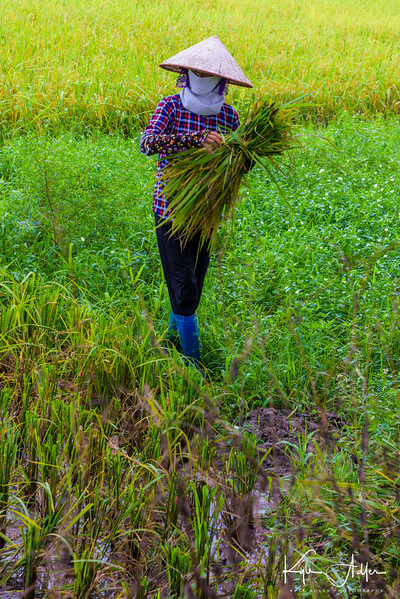 En route to the Hanoi Airport for our flight to Hue, we stopped to say hello to several farmers harvesting rice by hand. A good portrait doesn’t need to include the face of the subject, nor even the subject’s head at all. This portrait works because of the strong composition and lovely color palette, and one feels a connection to the subject even without seeing her face. 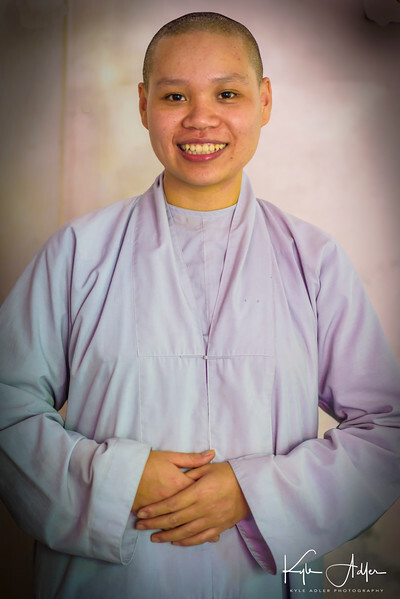 We had a lovely visit with a Buddhist nun at the Dieu Thanh Pagoda in Hue. It was fascinating to learn about her life in the convent and her decision process to give up worldly life as a young teen. To make her portrait, preparation was important. I had my gear all set up while we were having our discussion, so that when we were comfortable together I could simply ask if it was okay to make her portrait and then shoot without interruption. Aboard a “dragon boat” on Hue’s Perfume River, we attended a private performance of a cultural show featuring traditional Hue song and dance. A fast prime portrait lens (85mm) allowed me to shoot this musician using available light with a shallow depth-of-field to offset him from the background. 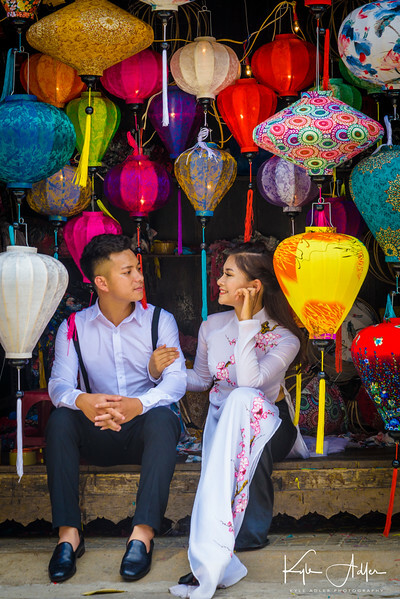 Hoi An is a charming city adorned everywhere with colorful lanterns. This bride and groom were posing for photos, so (with the permission of the couple and their photographer) I jumped in and captured this portrait. 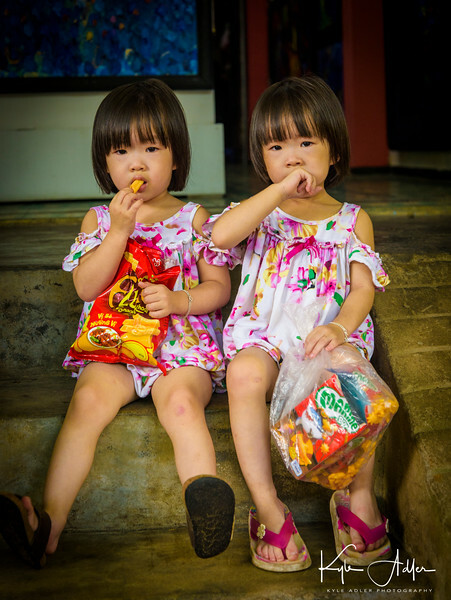 I chatted with these twin three-year-old cuties and their Mom as we browsed in her shop. With young kids, it’s important they feel at ease before you start shooting, and you should then shoot many frames quickly in order to increase the likelihood of getting one that captures the mood well. 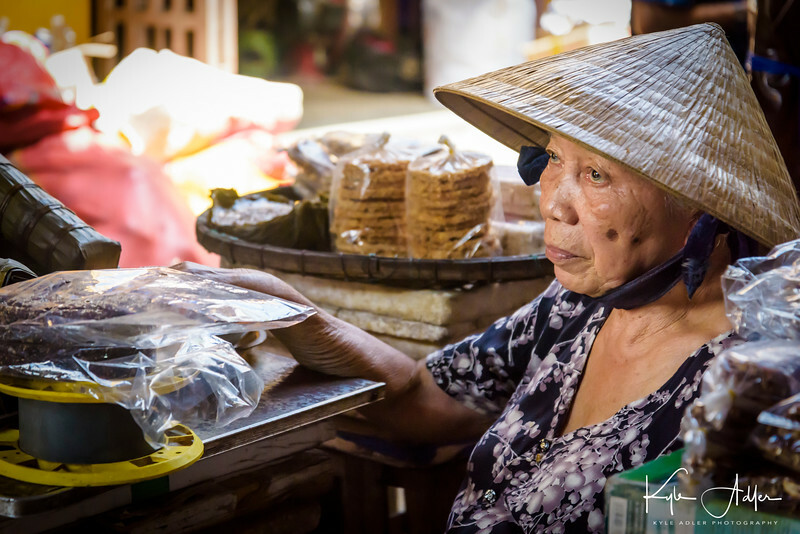 Hoi An’s central marketplace is a wonderful space to capture portraits of the many vendors selling traditional wares. The natural light was lovely, but required some finesse due to the bright background relative to the dim lighting on the subjects. At My Son Sanctuary, site of the most significant ruins from the Champa Kingdom, we attended a performance of ancient Cham dance. I used a fast portrait lens at a wide aperture and a high ISO sensitivity setting so that I could capture the dancers using a fast shutter speed. In addition, I used a touch of off-camera fill-in flash, not as the primary light but to fill in the shadow areas and obtain more color saturation. Outside our restaurant in Nha Trang, our waitress checks her messages. I was drawn to this framing because it succinctly captures the modern life of young working urban Vietnamese people. 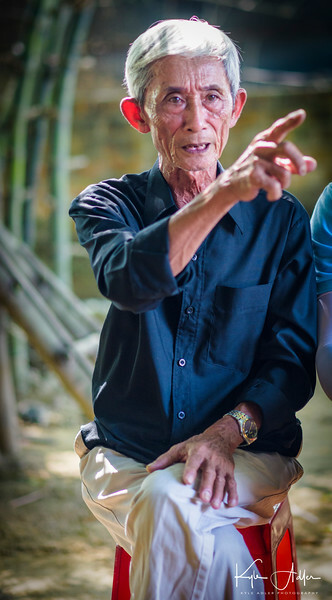 Fascinating discussion with Xom Gio Village’s chief, a former South Vietnamese soldier and survivor of the re-education camps who managed to work his way up to a high-level position after the war. To capture this striking portrait, I used a fast prime lens almost wide-open to cast the background into soft focus, and I waited for dramatic moments during our conversation to shoot. The wife of Xom Gio Village’s chief. I used the same technique, described above, as for the portrait of her husband. This portrait has a lovely color scheme, beautiful framing, and nice bokeh (the soft, out-of-focus parts of the background). The beautiful city of Dalat, high in the mountains, has been a favorite escape from the tropical heat since French colonial times. We spent a lovely afternoon with students from Dalat University. 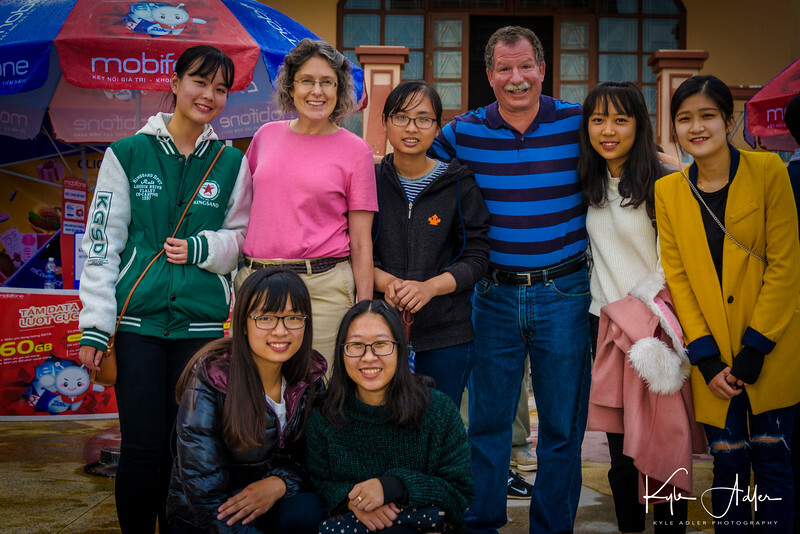 I had the opportunity to get to know English teacher Trung and his bright young students Nhi , Diễm, and Giang. For this portrait, we were joined by my wife and several students she accompanied. To include yourself in a group portrait, first set up the camera carefully, then either mount it on a tripod and trigger it remotely or ask a trusted person to release the shutter for you. A wonderful visit to village of Buon Chuoi, home to the Kho Chil ethnic minority. We were among the very few foreigners ever to visit this hill tribe area. 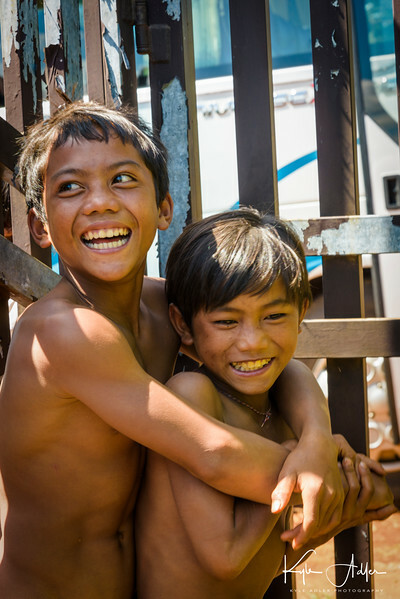 Have you visited Vietnam or Cambodia? What were your favorite photographic subjects? Please leave your thoughts here. 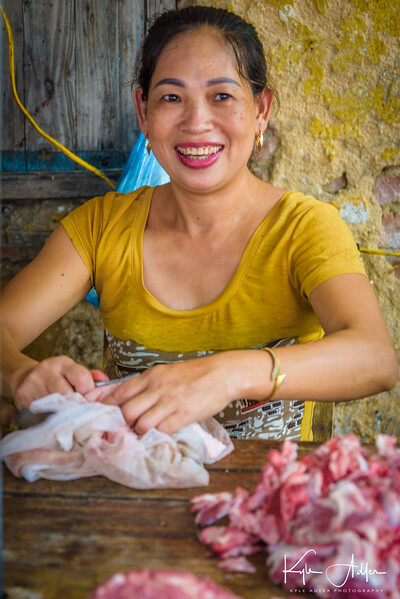 All of these photos and many more from Vietnam and Cambodia are available for viewing or purchase here: Vietnam and Cambodia image gallery.